Halobacterium salinarum is a microorganism and its ability to survive in extremely salty environments, such as the Dead Sea or the Great Salt Lakes, makes it an extremophile. It is a misnomer as rather than being a bacteria, it is actually a member of the Archaea kingdom. While the typical salinity of sea water is 0.6 M, H. Salinarum requires an environment of at least a 2 M NaCl to survive. Ideally, a solution of 4-5 M NaCl that is at a temperature of 37-42 degrees Celsius allows these microorganisms to thrive the best. The red carotenoid pigments in its membrane cause the water surrounding it to appear pink. is used in the Ecological Networks Module to teach students about concepts such as networks among and within living organisms and skills such as testing hypotheses and using micropipettes and spectrophotometers. Students start by working with a cell phone network model on the program Cytoscape as a way to introduce them to the concept of networks and understand how the nodes of a network interact. Following this introduction, they learn about extremophiles and later on, Halobacterium salinarum. The teacher then shows the students the Great Salt Lake and the class moves on to experiment with varying molar concentrations of NaCl in the growth media used to grow the Halobacterium salinarum. What many teachers are seeing is how the Halobacterium salinarum survives beyond just the time of the lessons and they would like to continue growing the microorganisms. While the Systems Education Experiences does have funding to provide teachers with kits to carry out the lesson, complete with the growth medias and different strains of Halobacterium salinarum, most teachers that would like to continue growing the microorganisms look for the ingredients to make a growth media rather than asking for another kit. However, many science teachers are not given a large budget for their classroom materials and thus, it becomes necessary to find more affordable alternatives to the dry ingredients used in the 4.3 M CM (CM stands for complete media) that is used as the growth medium for the Halobacterium salinarum. One of my main projects this summer was to test for alternatives to the more expensive materials used in the media and conclude which would be suitable to use. The catch: someone must be able to find these alternatives at a local grocery. NaCl, magnesium sulfate, sodium citrate, potassium chloride and Oxoid Peptone are the dry ingredients used in the media. The goal was to find alternatives for the NaCl (that we use in the lab), potassium chloride and the Oxoid Peptone. After a few trips to QFC, my mentor and I bought Diamond Crystal’s Kosher Salt as a substitute for lab NaCl and soy beans, lentils and nutritional yeast as alternatives for Oxoid Peptone. We also used milk powder as a Oxoid Peptone alternative. 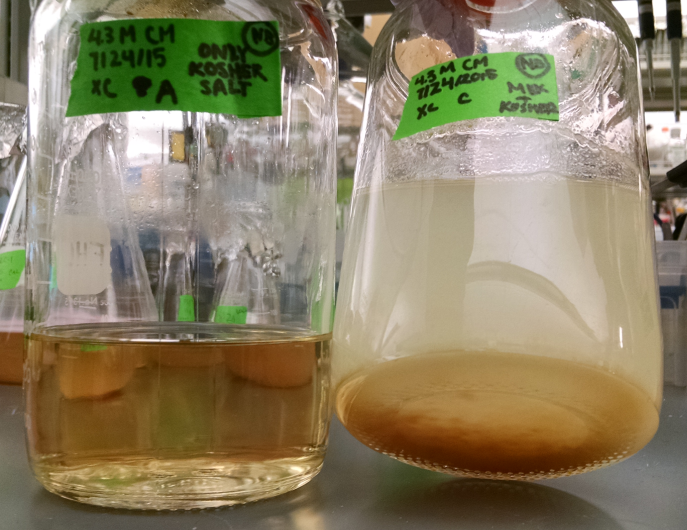 Sample 1 is using new Halobacterium salinarum and Sample 2 has both old and new strains. To test the alternatives, I used substituted each alternative in equal amounts to the original ingredient while making the growth media. 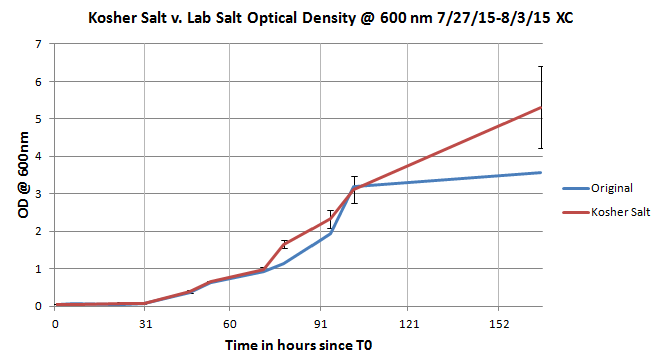 For example, instead of using 250g of lab NaCl, I used 250g of kosher salt. 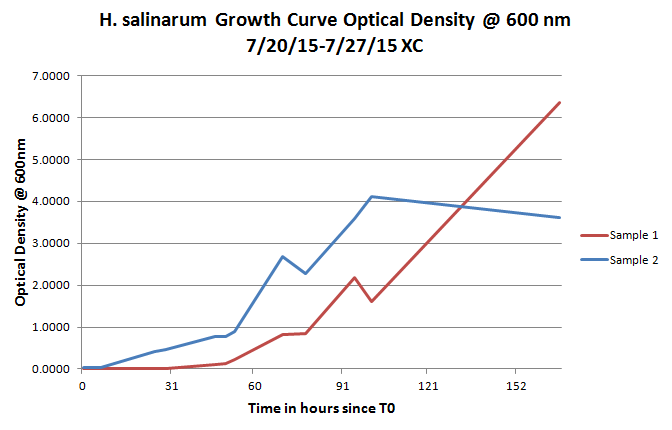 Before testing any options, I needed a growth curve of the Halobacterium salinarum in the original 4.3M CM. 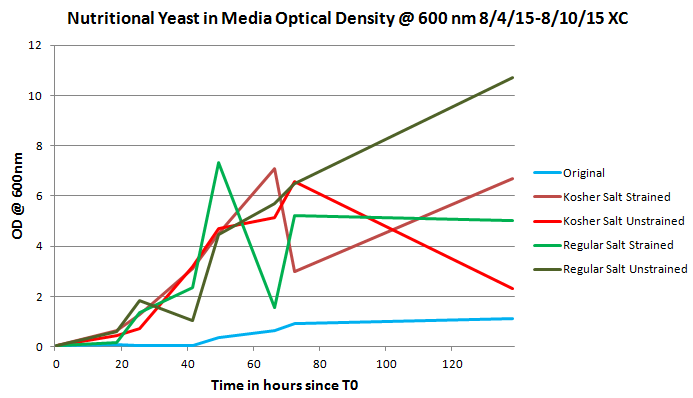 I took optical density measurements for two strains of Halobacterium salinarum for about a week. 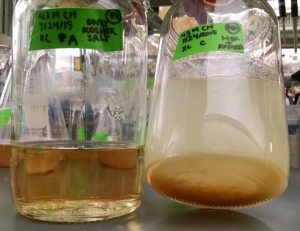 One strain of made of completely new Halobacterium salinarum while the second one combined equal amounts of new Halobacterium salinarum with Halobacterium salinarum that had already been growing in growth media. As shown from the graph on the right, sample 2 can be seen starting its exponential growth phase sooner than sample 1, but enters the stationary phase of growth near the end of data collection while sample 1 continues in the exponential growth phase. To take the measurements for the Halobacterium salinarum in the new growth medias, I used a spectrometer, like I did for taking measurements for the Halobacterium salinarum in the original growth media, and took measurements twice a day. To start the strains of Halobacterium salinarum in the new growth medias, I would take a certain amount of Halobacterium salinarum from Sample 1 (referring to that of the original growth curve) that I calculated to result in an optical density measurement of 0.05 in the new strain. This allowed me to minimize the amount of time the Halobacterium salinarum spend in the lag phase of growth. Kosher salt has a name that is often misinterpreted. The difference between the shape of kosher salt and regular table salt is that kosher salt crystals are shaped more like flakes than the cube-like crystals of table salt. The shape assists the kosher salt during the process of making kosher meat because it absorbs more blood from the meat. The reason I did not use table salt as an alternative is because many brands carried iodine in their table salt and I wanted to limit extra ingredients as much as possible. The NaCl in the lab was from Fisher Scientific and costs about $0.12 per gram if someone were to buy the 500g package. The kosher salt we used was from the Diamond Crystal brand and costs about 0.3 cents per gram when buying the three pound box. 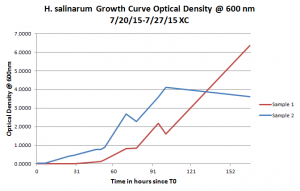 This is the growth curve of the Halobacterium salinarum in the kosher salt media versus the original media. Three flasks with Halobacterium salinarum in kosher salt growth media and one flask (the control) of Halobacterium salinarum in the original growth media were grown. 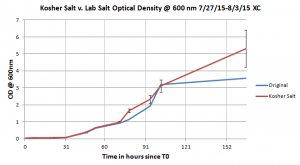 The graph on the right shows the average growth of the Halobacterium salinarum in the kosher salt media in comparison to that in the original media. This alternative appeared to be highly successful because the growth curves are similar. A possible reason for the points when using the kosher salt media resulted in more growth for the Halobacterium salinarum is because the lab NaCl would be much more pure than store bought kosher salt so there may be traces of additional nutrients in the kosher salt I used. On the left is the kosher salt media (which looks physically identical to the original media). On the right is the milk powder media after coming out of the autoclave. This was one of the alternatives that did not work. After autoclaving the media, I found that the media was not homogeneous as the milk powder condensed at the bottom of the bottle. After considering the temperature of the autoclave, the amount of salt added and talking to my mentor, I concluded that, in a way, I made a form of cheese. Clearly, milk powder is not a recommended alternative for the Oxoid Peptone. However, I did learn that filtering any residual substances from the media could be an option for other tests and I did use this technique when I tested nutritional yeast. This is the graph of the growth curve of each of the different strains of alternative media versus the original growth curve. There were four new varieties of media that the Halobacterium salinarum were grown in. In two of the medias, kosher salt was used as a substitute for lab salt and nutritional yeast was used as the substitute for Oxoid Peptone. In those two, one media was strained using a coffee filter to remove any residual nutritional yeast left after the autoclaving process while the other was left unstrained. Two flasks of Halobacterium salinarum were started with the unstrained media and three were started with the strained media. In the other two medias, a similar process was conducted except lab salt was used and nutritional yeast was used instead of Oxoid Peptone in the growth media. 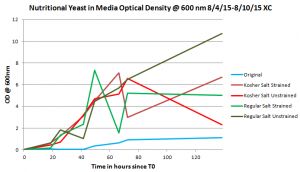 There was some inconsistencies in taking the data because in the unstrained medias, varying amount of nutritional yeast that had condensed at the bottom of the flasks would be collected by the micropipette during data collection, rendering some of the optical density measurements to be unreliable. Thus, without reliable data, nutritional yeast could not be said to be a possible alternative for teachers to use in making their own medias. 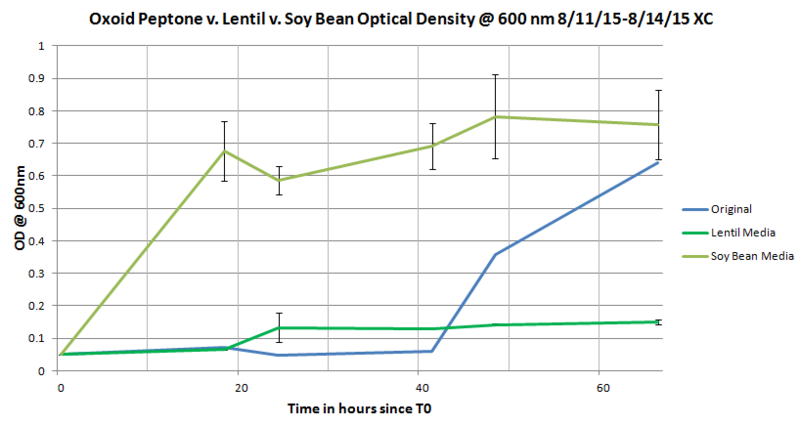 This graph shows the growth curves of the Halobacterium salinarum grown in the soy bean media, the lentil media and the original media. There were two different medias used here. 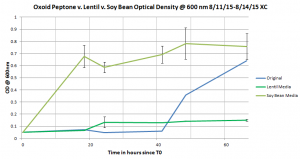 While both contained kosher salt as a substitute, but in one media, lentils were used as a substitute for Oxoid Peptone and in the other, soy beans were used as the Oxoid Peptone substitute. Three flasks of each media with Halobacterium salinarum in them were started. To prepare the beans, I sprouted, dried and ground them. First, I poured the soy beans and lentil beans into separate large plastic tubs, filled the tubs 3/4 full with water, covered them with foil and set the tubs in an area out of direct sunlight, such as a lab bench. I did this in the morning. That afternoon, I drained the tubs of water, covered with foil and set it back on the lab bench. I would drain and rinse twice a day for 48 hours. Then I spread the beans on separate sheets of foil that were in a 45 degrees Celsius dryer and dried the beans for eight hours. After that, I turned the dryer off and left the beans on the foil and in the turned off dryer for just under 3 days. Then I used a mortar and pestle to grind the beans into a fine powder which was then weighed and used in the growth medias. The soy bean media seemed to have a growth curve that mimicked the original growth curve and those two growth curves seemed to have a similar trajectory. The lentil growth media resulted in the Halobacterium salinarum having a steady but slow growth rate. The best options for a more affordable growth media recipe would be using soy beans instead of Oxoid Peptone and kosher salt instead of lab NaCl. Buying the smallest containers of NaCl and Oxoid Peptone from Fisher Scientific would cost $174.22 before tax and shipping and results in a cost of $2.28 per liter of media. Buying the smallest amounts of kosher salt and soy beans from the local grocery store costs $5.69 which led to a cost of $0.78 per liter of media. Using the alternative ingredients would save teachers $1.50 per liter of growth media. This amount of savings would definitely add up over the amount media a teacher would prepare. While one of my original targeted ingredients to find alternatives for was KCl (Potassium Chloride), I was unable to due to time constraints. However, one substitute that has potential is to use salt substitute from the grocery store. Salt substitute’s main ingredient is usually KCl. While there are other added ingredients in salt substitute, I could not find any records of these ingredients being potentially harmful to Halobacterium salinarum. In addition, if this were to prove to be successful, a teacher would save an additional $0.20 per liter of media. This was an eye-opening project that I am incredibly grateful to have been able to work on. I learned many lab techniques and I have also realized the high cost of many materials used in lab work. This experience has caused me to become interested in the idea of affordable and accessible education. In addition, I was able to work with microorganisms that turn the surrounding water pink which is pretty cool!